When we reflect on the situation of living beings, we see that all beings are searching for happiness and trying to avoid suffering. All of our activities are directed toward that purpose. We focus on the external world, on objects outside ourselves, and hope to find genuine happiness there. But if we depend only on our external circumstances for happiness, we find that they don’t last. Their nature is to change. We can find some temporary happiness in the external world, but it’s not long-lasting or genuine. We can find a genuine sense of peace and well-being within ourselves. Peace comes about when our thoughts begin to calm down. Only through working with ourselves, with our mind, can we find peace. It’s not something to be bought in the marketplace. When we meditate, we begin to calm the busyness in our minds. Our thoughts, especially our negative thoughts, begin to calm down. We need a point of focus to calm our minds. The simplest method for calming our mind is to focus on the breath, an object that is uncomplicated and from which we are never separate. Take a seat on a cushion on the floor or in a chair. Keep your back straight and allow your gaze to rest in the space in front of you. Allow your mouth to be slightly open and the jaw relaxed. Notice your breath as it enters and leaves your body. Begin to count your breaths. Count each inhalation and exhalation as one breath. Continue counting until you reach twenty breaths, then begin again with number one. If you lose track of your count, gently begin again with number one. Alternatively, you can count your breaths using a mala (Buddhist rosary). With each breath, count one bead until you have completed one round. Notice as thoughts rise, but don’t follow them. Allow your focus to remain on the rising and falling of the breath. If you find yourself carried away by your stream of thoughts, return to following your breath. Rather than doing one long session where you get tired or bored, do short sessions many times each day. Also, take breaks within sessions. For example, if you’re just beginning, you might count twenty breaths and then take a short break. If you feel comfortable with a longer session, that’s also fine. The main point is not to be too tight in your focus. We need just enough attention to remember our reference point. It’s important to have a noble intention as the motivation for our practice. Have a kind heart and wish that your meditation practice be of benefit to others. In each session of practice, consider training for half of your time on calm-abiding and the other half on developing loving-kindness and compassion through tonglen. Tonglen is a meditation practice through which we can give rise to the loving and compassionate intention known in the Buddhist tradition as bodhicitta. Bodhicitta is the sincere and genuine wish that all sentient beings be freed from suffering and its causes and that they achieve a state of ultimate happiness. Tong means giving, and len means receiving. What do we give and receive when we practice tonglen? We mentally give others all of the happiness that we possess, as great or as small as it may be, and we receive the suffering and difficulties that other beings experience. The purpose of this practice is to reduce our fixation on ourselves and to develop love and compassion for others. Through this meditation, we turn our mind inside out—we step out of our self-centeredness and turn our minds toward the needs and circumstances of others. . As our concern for others begins to increase, the intense fixation we have on ourselves, and our disturbing emotions, begins to decrease. As this process unfolds, we begin to feel more ease and peace of mind. When we practice tonglen, the easiest way is to join the visualization with the inhalation and exhalation of the breath. On each breath we either give or receive. Breathe through the nose and the mouth. This will help you develop calm-abiding at the same time. The meditation begins with one person then broadens in scope as we progress through each step. 1) Begin by bringing to mind one person whom you care for deeply, someone who has been extremely kind to you, like your mother or father. Practice the visualization of giving and receiving with that person, allowing love and compassion to arise in your heart. 2) Think of your loved ones–your family, friends, and anyone for whom you have a strong affinity and concern. Practice the visualization of giving and receiving with these people, again allowing the heart to open. 3) Think of individuals who experience great suffering. They can be either humans on non-humans and may be near or far away. Imagine the pain and difficulties these beings experience and practice giving and receiving. 4) Think of a person you don’t know and toward whom you feel totally neutral. Knowing that this person, like all beings, seeks happiness and wishes to avoid suffering, practice giving and receiving. 5) Think of a difficult person in your life, someone who you don’t like or get along with. Practice tonglen for this person. 6) Imagine all sentient beings before you. Embracing every living being without exception, practice giving and receiving. Completely tame your mind; this is the teaching of the Buddha. What is the Basis for Taming the Mind? The nature of mind of all sentient beings that is the primordial unity of lucidity and emptiness, buddha nature. What is to Be Tamed? All adventitious factors that can be removed and that obscure the positive qualities of buddha nature—ignorance, karma, disturbing emotions, and deluded appearances—the causes and conditions for suffering. What is the Fruition of Taming the Mind? The temporary and ultimate fruition is non—deceptive peace and happiness. The correct path, a path that has the capacity to eliminate the suffering from which we wish to be freed while resulting in the attainment of happiness in its entirety. How Do We Tame the Mind? By relying on a qualified lama with pure and authentic lineage, the path of skillful means and wisdom is practiced by alternating study (listening to teachings), contemplation, and meditation. Taming the mind in this way through gradual stages is extremely important. If we practice according to the Buddha Shakyamuni’s own examples that illustrate the gradual stages, such as the refinement process for a lapis lazuli gem, we will definitely engage in a complete and correct practice containing the vital points that lead to maturation. This is because of the enormous benefiting power for each individual with their myriad elements1 and inclinations, when they practice in accord with the proper sequence of teachings of the universal tradition of the buddhas. The first stage of taming the mind: the outer instructions. The first stage of taming the mind correlates with the refinement process of a lapis lazuli gem. The gem is initially soaked in salty water then scrubbed with a rough cloth. This process removes the coarse and external impurities. Likewise, having been introduced to Buddhist philosophy, the trainings begin by focusing on calming the most coarse and obvious kinds of discursive thoughts and emotions, thereby relaxing and opening the mind through meditating on love, compassion, and basic meditative concentration. Following this, the actual doorway to the Buddhist path begins with an explanation of the qualities of the three infallible and supreme jewels and is well established by taking refuge. Then, by receiving explanations on texts containing teachings on the four seals which signify the view and the four noble truths, we gain understanding of past and future lives; the adopting of positive action and refraining from negative action; the pitfalls of samsara and the positive qualities of nirvana; the nature of all composite phenomena to be suffering and impermanence; and so forth. Receiving these instructions and applying them through practice results in an accurate worldview, which brings a certainty that engenders a determination to pursue liberation.2 It is necessary to establish this understanding as a stable foundation for the path. The second stage of taming the mind: the inner instructions. The second stage of taming the mind correlates with the middle process of refinement for the gem, whereby it is soaked in a special fruit juice compound and scrubbed with a wool cloth to remove the next layers of impurities. This stage is the entranceway to the Mahayana. At this point, all of the methods of mind training in the two-fold intention of bodhichitta3 are taught through oral instructions on texts such as Entering the Way of a Bodhisattva, The 37 Practices of a Bodhisattva, and The Seven Key Points of Mind Training. Having trained the mind according to these instructions, the mind will be saturated with bodhichitta and experience its benefits. With bodhichitta as the foundation, we train in the six transcendent perfections and specifically in the meditations of shamatha (calm abiding) and vipashyana (the profound view of transcendent wisdom that knows the nature of all phenomena to be emptiness). To realize this wisdom, we receive teachings from the Buddha’s own words, commentaries by realized holy saints of the past, and pith instructions from our own root guide’s personal experience. In this way, we work through our doubts to arrive at an indwelling and definitive certainty; this requires studying these profound teachings again and again, as well as applying them to taming the mind. The third stage of taming the mind: the secret instructions. The third stage of taming the mind correlates with the final stage of refinement, in which the gem is soaked in a medicinal compound and then polished with a soft silk cloth to result in a flawless gem, free of impurities. At this point, we enter into the practices of Vajrayana, the profound methods that bring liberation through the realization of and familiarizing in our buddha nature essence—the timelessly pure nature of mind. It is important to understand that what is called “Vajrayana practice” does not necessarily mean that it has to involve the methods of deity visualization. For those who are not inspired to develop deity practice, there are other methods for taming the mind that can be known through the pith instructions of the lama. In general, these practices need to be preceded by training the mind through the Ngondro (preliminary practices) and followed by receiving empowerments that mature, or ripen, our mind stream. Using the development stage practices that apply the key points of “the mandala of the purity of all possible appearances” is called Mahayoga. Harnessing the channels, energies, and vital essences of our body is Anuyoga, which when relied upon becomes an expeditious means to liberation. Further, the secret teachings directly and nakedly introduce the nature mind, buddha essence, through the great perfection pith instructions of Ati Yoga. Relying on the three yogas, we gain understanding, experience, and realization of true abiding nature, which enables us to progress swiftly on the path. Thus, finding freedom in ultimate liberation, enlightenment will be attained. Furthermore, for those of you who have not yet begun practicing the path, or who give the mere appearance of practicing the path, or who engage in the path but do not know the proper methods to practice, it is in accord with the way things are that you will see none of the results of taming the mind. Therefore, it is absolutely vital from the very outset that we base our practice on properly discerning what is positive and negative—what we should and should not do in both practice and conduct—so that everything is in accord with interdependent origination. I wish to encourage you to practice in this way. This I offer with folded hands at my heart in humility, love, honesty, and openness. 1. This word, khams in Tibetan and dhatu in Sanskrit, has a vast spectrum of meaning, ranging from the four elements to personality, all of which are different aspects or constituents of our physical and mental experience. 2. This word, nges ‘byung, is a philosophical term that has often been translated with the word “renunciation”. However, it has a very specific meaning that literally translates as “an arousal of certainty”. This term carries two specific connotations: one is a certainty about the basic nature of our experience to be dissatisfactory and painful; thus it is marked by a disenchantment, or sadness, for the basic state of existence. The second aspect of certainty is about liberation and the need to attain it. Here, the meaning has been translated versus settling on a term that does not cover the concept. 3. 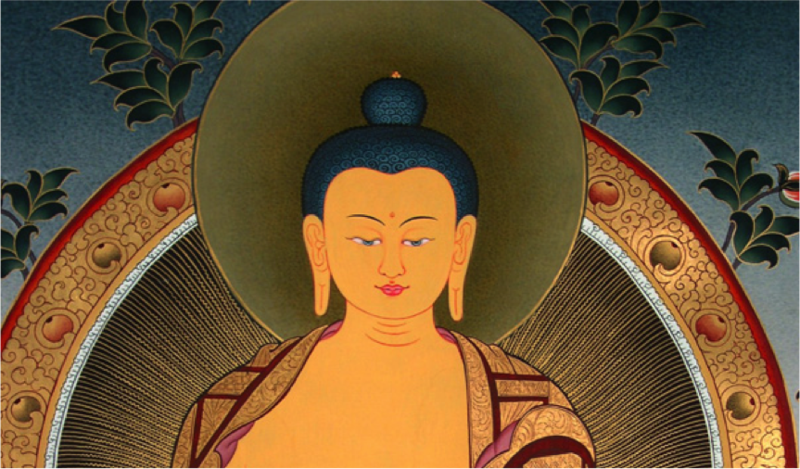 Bodhichitta can be rendered in English as something similar to “enlightened intention”. It is often referred to as “the two-fold intention”, because of the two facets that define it. These two are, the loving and compassionate wish to benefit others and the motivation to seek enlightenment as the means to accomplish that benefit.